DOUBLE WOW. Wow, wow, wow! (that was a triple wow) That quilt is absolutely wonderful. I LOVE it. Wow, doing that by hand is just amazing. I've just started teaching myself hand quilting and my stitches are about the same. But I would never have the patience to even do a whole doll quilt by hand! It totally looks like it's worth the wait for the swap. As far as a name, how about Kaleidoscope? I was thinking of the way the colors move about on the quilt and the tilt of the pieces and it reminded me of a kaleidoscope. The movement of the quilt also made me think of the name Shimmer. Its fantastic! The color combinations are so pretty. Great quilt with so much movement in the piecing. 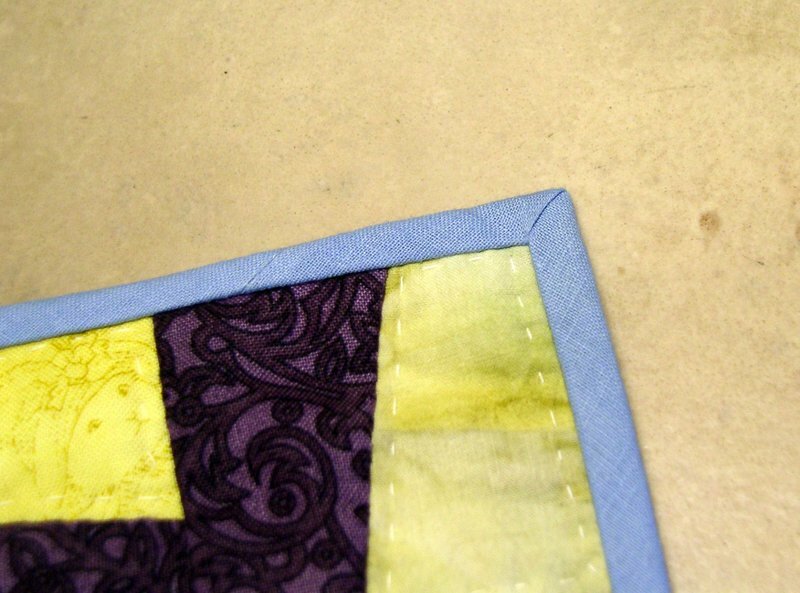 And the hand quilting gives it a lovely texture. Wow - amazing binding too. Thanks for posting it - it's adorable! What a great little quilt, Michelle...You did a fine job in the design and the vision for it. So,so beautiful. I love it! Michelle! It's beautiful! WoW! 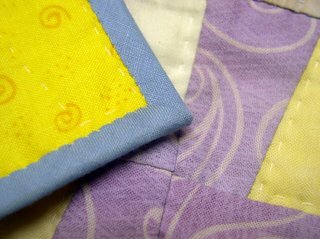 Quilting is something I've always wanted to try, but the time involved makes my head spin! 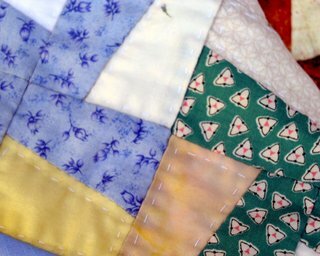 A doll quilt, that more my pace. Although, my list is miles long and just became more complicated with the purchase of a "new" home. New to us, that is. And it's a fixer-upper (eeeks!). We'll be working on it all summer. Anyway, your quilt is lovely. I especially love that it is made from scrap pieces. super pretty! so is it just the square cut on an angle for the shape??? i would love a quilt like this! lucky lisa!!! Completely fantastic! I just love it. This is a really wonderful quilt - gorgeous colours and design! great quilt-wow!!! just love it!! Your quilt is amazing! You should be really proud! Ooooh, Michelle, it's gorgeous! I have been behind in blogland, sorry. But I had a few minutes and wanted to check in with you. 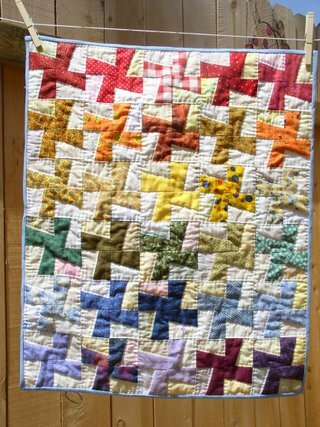 very pretty, summery quilt. My name suggestion would be "windblown posies" cause that's what they look like to me...little flowers dancing in the breeze. Lucky lady who receives it! This is a gorgeous quilt Michelle, thanks for the inspiration! This quilt is absolutely beautiful. I love it! How about Whirlibird? 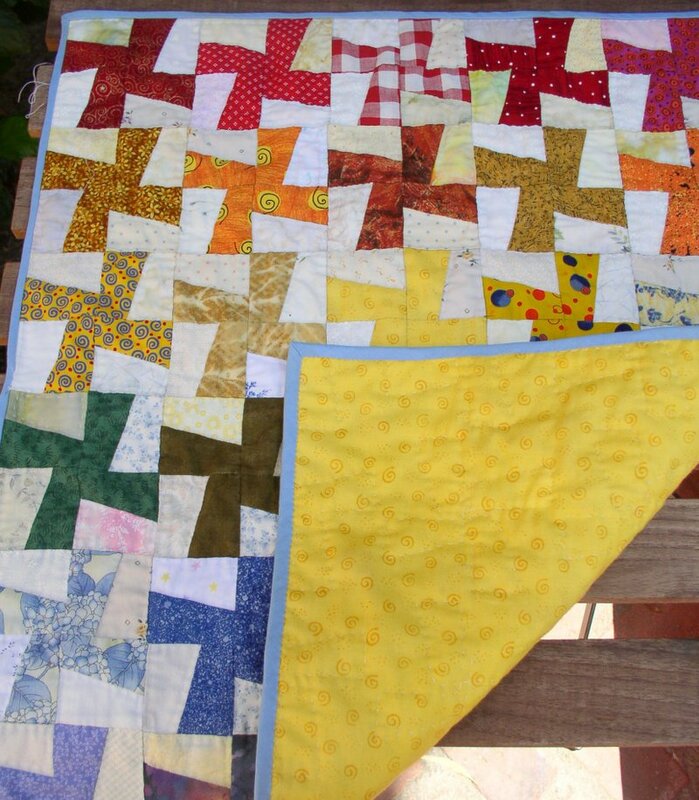 :) I realllly like the quilt - I'm sure its recipient will as well! How about the name Cartwheels? With the spin of color make childs play. Fantastic quilt!